Veterans serve our country proudly, and yet, sometimes need a little bit of help themselves. 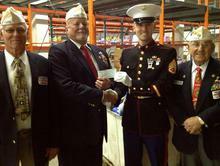 Our organization aims to assist veterans when they are in need. We are funded 100% by private donations, from patriotic Americans like you! In addition to helping veterans file for their benefits and/or providing emergency funds, we give back to our local community. We offer undergraduate college scholarships to veterans and their family members, based on financial need.